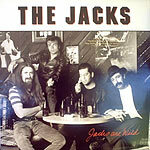 CD review: "Jacks Are Wild"
This review first appeared in the April 29, 1988 issue of the San Diego Evening Tribune. The Jacks formed about two years ago when Buddy Blue was still with the Beat Farmers, the first band from San Diego's 1980s club scene to sign a national recording contract. Like the group's live shows, "Jacks Are Wild" represents one of the better dollar values from the music world in recent memory. The album features 10 original tunes penned by lead singer/guitarist Blue and bassist Chris Sullivan. In addition to the great music, Rounder Records has put together some highly polished packaging to support the release, including properly demonic liner notes by local singer, MTV star and perpetual curiosity Mojo Nixon. There's nothing at all polished about The Jacks' music, though, and that's a good thing. They offer a no-frills tour of four-beat, 16-bar rhythm and blues and rock 'n' roll. The music is classic American, drawing equally from the urban sounds of Memphis, Chicago and Detroit and the rural backcountries of the South and West. Blue was teethed on soul and gospel as a kid in Syracuse, N.Y. "I grew up listening to music from Stax and Motown," he said in an interview in his La Mesa home. "By the time I was a teen, I was heavily into the blues." But Blue doesn't claim any blues mantle for The Jacks. "We're not really blues-based," he said. "Almost every kind of music has been ripped off from blacks. I've never found a white blues band that really moves me. The Jacks are kind of a loud, rowdy soul band. We don't have a stage show, we just kind of ... have fun." If not a blues band, The Jacks are drawn from the same cloth that birthed the blues. Syncopatic rhythms laid down by drummer Jack DiMatteo and Sullivan's percussive bass form the backbone of The Jacks' sound, and keyboardist Mighty Joe Longa gets more soul out of his trusty Hammond organ than most players get out of whole bank of modern synthesizers. Whether singing a mournful love song or an upbeat rocker, Blue's unassuming manner is in acute contrast to his powerful vocals. His guitar sound is clean and his leads articulate but simple. "Jacks Are Wild" sounds as though it could have been laid down a quarter-century ago, and makes one realize that the early rock/soul sound of the late '50s hadn't run out of ideas when popular music tastes moved on to other schools. The album starts off strongly with "For the Night," featuring a short, simple melody that will run through your head for days. Things really take off, though, on the second song, "I Don't Care." Blue's nimble vocals are tastefully set off against Dana Garrett's saxophone work. "Can You Feel It" slows the album down a bit, with Blue stretching out on vocals and even whistling a chorus. "Lost on the Way" is a fast rocker, and on "De-Motivated," Blue shows fine form on the harmonica. If Side One belongs to Blue, the second side features the rest of the band a bit more. Longa finally gets a chance to let loose on organ on "Mama's Boy," with a hypnotic opening riff and then a solo full of a deep-seated feeling for the music that just can't be faked. Garrett contributes another strong sax solo, while Blue's slightly nasal voice is at its most expressive. "Somethin' Funny Goin' On" is nearly as strong as "Missing You." Blue and Sullivan set down a percussive broken-chord intro on guitar and bass on the most countrified song on the album, while Longa gives a clinic on playing the Hammond soul-style. Blue finishes the song with a slide solo that reminds again what a stellar guitarist he is. The album closes with "My Old Neighborhood," which is strong enough that it could just as easily have opened the album.